A good Crock-Pot pea soup recipe is Taste of Home's slow cooker split pea soup, which includes dried green split peas, ham, chicken broth, vegetables and herbs. The Food Network has a similar recipe, but it substitutes smoked turkey for the ham and includes frozen peas and plain yogurt. Add a 16-ounce package of dried green split peas, 2 cups of cooked cubed ham, 1 chopped onion, 1 cup of chopped carrots and 3 minced garlic cloves to a slow cooker. Season with 1/2 teaspoon of dried rosemary and 1/2 teaspoon of dried thyme. Pour in 32 ounces of chicken broth and 2 cups of water, and cover the slow cooker. Cook for eight to 10 hours on the lowest setting. In another recipe, first add 1 pound of green split peas, 1 thinly sliced leek, 2 cut celery stalks and 2 chopped carrots to the slow cooker. Season with 1 teaspoon of salt and 1/2 teaspoon of pepper. Suspend a bundle of 8 parsley stems and 4 thyme sprigs tied together into the mixture. Pour 7 cups of water in the slow cooker, and add 1 smoked turkey leg. Cook covered on low for six to eight hours. Remove the herbs before shredding the turkey meat. 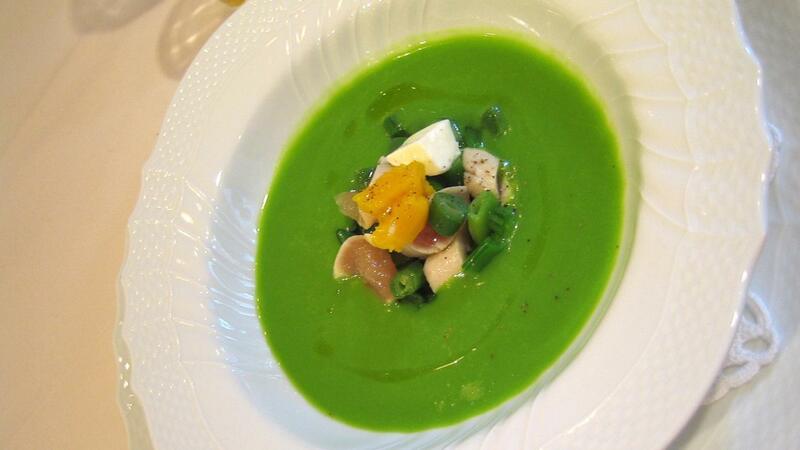 Serve with thawed green peas, nonfat plain yogurt and crusty bread. What Is a Simple Recipe for Crock-Pot Chicken Stew?